Does your home make you feel positive or comfortable? If not, you should consider rolling up your decorating sleeves to massively redefine the atmosphere of your home. 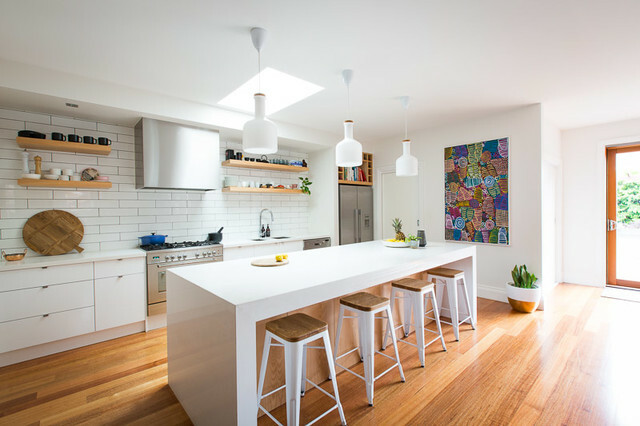 The following tips will help you take your kitchen’s outlook to the next level. Redecorating with art and certain elements of nature can go a long way in improving the serenity of your home. It will make your living space look elegant and feel calmer. This can be achieved by utilizing floral or wooden arrangements and decorating with beautiful plants. Incorporating art can really be therapeutic, and it is an incredible way to give your home a sense of appeal and pizzazz. If you want a whimsical design, choose uniquely textured artwork, family photographs with stylish frames or ornate rugs to artistically garnish your room. Consider Cabinet Refacing. Your house should be reflective of your style, values, and things that you love. Remember, the stylish vibes from your home can assist you to maintain a positive attitude from day to day. Much more goes into decoration than furnishings. Put some heart and effort into stylizing your living space with things that boost its mood, atmosphere, and elegance. This may include your preferred flowers, plants, family heirlooms or any other things that bring back fond memories. Your home is the only place you can find inspiration, comfort or a quite escape, therefore, keep it cool. A beautiful house gives you confidence on all days of your life! Good lighting brings out your personality while adding warmth to your home. You can enhance a room’s lighting by including pendant lights, lamps, sconces or installing customized lighting systems. Remember to do so for your closets, kitchen counters, and halls as well. Important for cooking, lighting can also help create a positive mood and feel at the flip of a switch. Color can really be exciting and helps boost your energy level. A vibrantly colored splash back is an awesome way to revitalize your home and liven up your mood all day long. Incorporate acrylic, Perspex, or back-painted glass, and tactfully fit down-lighters below the wall units to create a fanciful outlook. Identify walls which need some color and choose colors that best suit your desire. Roman blinds are great for kitchens and the perfect way to boost a simple design with zingy patterns and attractive color. Since this method requires small pieces of fabric, choose something quite special that will make you smile every time you enter your kitchen. Squeezing a dining table into your kitchen can be fun as your friends can get together for a glass of wine whilst you cook- this is more enjoyable than leaving them lonely in the living room. Plus this drop-leaf design offers an amazing platform for parties and solo coffees alike. De-cluttering and organizing your kitchen not only adds aesthetic value to your leaving space, but it also serves as a perfect environmental depressor. Research has confirmed that there’s an apparent connection between clutter and despair. Messy rooms make your home look bad and also make you feel unhappy. People are now beginning to believe the idea that hassle-free rooms correspond to a hassle-free life. Kitchens are also for life, not just for meals. Furnish yours with books, pictures, rugs, and sofas for a clutter-free, welcoming space.